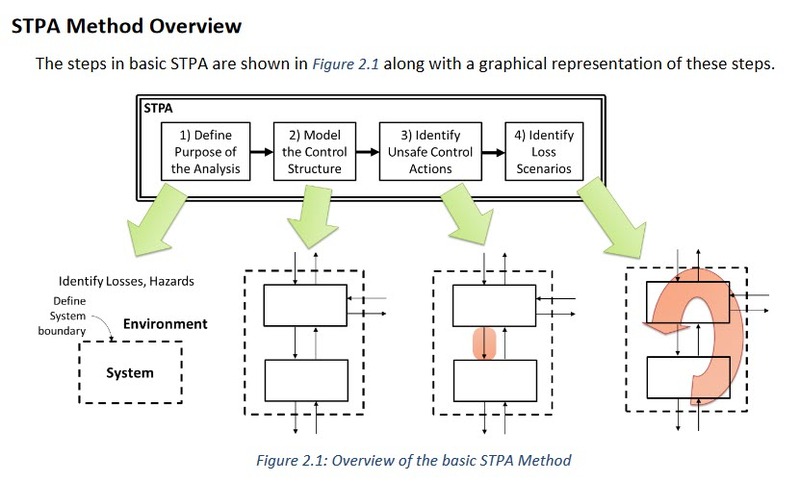 The graphical representation of the STPA Method Overview is an excerpt from the STPA Handbook, released March 2018. The Analyses section, as the name implies, is for the several different types of analysis needed in STPA. The STPA Project Overview tree presents the Analyses after the Models. When the project is created in the STPA module, then same name is automatically created for the Analysis. 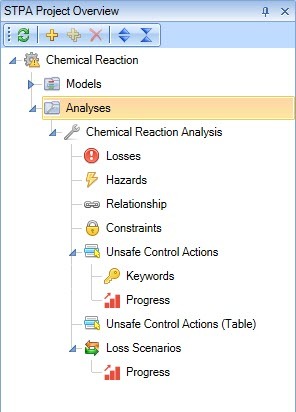 Defining the purpose of the analysis is often the first step of the method, but modeling the Control Structure can be started by the analyst while the losses and hazards are in the brainstorming phase. What kinds of losses will the analysis aim to prevent? Will STPA be applied only to traditional safety goals like preventing loss of human life or will it be applied more broadly to security, privacy, performance, and other system properties? What is the system to be analyzed and what is the system boundary? These and other fundamental questions are addressed during this step.